Since the demise of Sidewalk and Vernacular a couple of years back, South Australia has sadly been the only state without a quality magazine regularly publishing new writing. I am pleased to say that Wet Ink more than adequately fills the void. There is something very healthy looking about this first issue of Wet Ink. You get the impression that the people behind the publication haven’t had to sell their car and mortgage the house to put this into print, as is often the case with many of these ‘little’ magazines. There is an impressive list of sponsors, advisors and editors, as well as evidence that they’ve worked hard to attract advertisers. The production and design is first class, with generous space given to each piece of writing, and black and white illustrations throughout. The contents of this first issue are also mostly impressive. The highlights include an interview with Frank Moorhouse about the state of Australian publishing, and a mouth-watering appreciation of Adelaide’s food by Tom Shapcott. The short stories are a mixed bag. Angela Rotger’s ‘Spilt Salt’ is particularly good – beautifully written, full of rich detail and emotion. I also enjoyed Tom Morton’s ‘In Luminous Darkness’, despite its over-reliance on pop culture references, and Peter Barry’s ‘Palace of Justice’, an Orwellian tale of the not-too-distant future. I would have liked more poetry, although the poetry here is good, especially Amelia Walker’s ‘Genus Unknown’ and the aforementioned Tom Shapcott piece. There are also a handful of short pieces that are hard to classify. Not quite short stories, but definitely not poetry. A couple worthy of mention are James Roberts humorous ‘The Death Of Danny Boy’ and Sonja Dechian’s darkly funny review of last year’s flu epidemic. All in all, it’s an accessible and highly readable first volume. My only gripe is the length – only 56 pages. But these are early days, and there is plenty of room to expand once the magazine has become established. So subscribe, submit and support. Let’s make sure Wet Ink stays in print for a good many years. While shopping at the supermarket today, my daughter pointed out that you could now buy chocolate-scented rubbish bags. Chocolate-scented rubbish bags! I’m afraid it’s true. They are also available in strawberry, lemon, lime and lavender. I can understand citrus-scented products, after all, we’ve had lemon-scented floor cleaner and dishwashing liquid for some time, but chocolate-scented products are a different matter. It might just be me, but there is something very wrong about the idea of having your garbage smell of confectionery. 1. People are going to want to eat their garbage. 2. People are going to think of garbage next time they eat chocolate. Either effect is surely undesirable. I manage to resist my daughter’s appeal for chocolate-scented rubbish bags, and make a mental note to add the product to the list of ‘things I will never buy’. It might just be me, but isn’t the idea of displaying poetry in toilet cubicles a little objectionable? The Red Room Company, a non-profit organization operating out of Sydney, is currently calling for submissions to their Toilet Door Poems project. Poems exploring ‘issues of social, political, cultural and creative relevance’ will be posted on the back of toilet doors in Greater Union cinemas and Qantas domestic terminals during the month of April 2006. Now, as a poet, I realize I should be grateful for any opportunity available to expose my work to a wider audience. After all, I am frequently expected to have my work published without payment, and often read for free, it follows that I should be happy to have my poetry published anywhere, under any circumstances. However, I am having trouble visualising a constipated cinema-goer appreciating my delicate little piece about tulips, or my sunset haiku, or my witty political satire. They’re in the middle of watching ‘Cheaper by the dozen 2’ or some other monstrosity; they’ve eaten their mega-sized popcorn and guzzled their mega-sized soft drink; and now they need to take a dump. They shuffle, buttocks clenched, to the bathroom, squat in a cubicle, and find that all is not as it seems down below. Nothing is moving. They groan and they strain, grow red-faced and frustrated, and through watery eyes, begin to take in their surroundings. They notice that, instead of the usual dirty joke, telephone number, or inane obscenity, they are faced with a screed of words. Is it advertising? A story? A song? They read the first few words, then give up, and wish for the obscenity. Before long, they’ve ejected the reluctant stool, pulled up their pants, and vacated the cubicle, ducking out of the bathroom without washing their hands in order to get back to the zany climax of their zany movie. I can’t see the poems displayed in Qantas terminals faring any better. After all, the typical airplane commuter is primarily concerned with getting out of the airport as quickly as possible. The average airport loo is the last place I’d want to relax and read a poem. If these organizations were really serious about supporting the form they would dedicate some space in their in-flight magazine to poetry, or devote a few moments of screen time to a poetry reading. Offering space on the back of toilet doors is about as miserly as you can get. Poetry deserves better. The Red Room Company aims to ‘create, produce and distribute poetry, by new and emerging Australian writers, to the public, in unusual ways.’ These are admirable aims, and I would usually be reluctant to criticise any attempt to expose poetry to a wider audience. However, there is no need for us to be quite so desperate. Poetry may be the most undervalued and marginalized creative pursuit in the country, but that doesn’t mean we should accept anything thrown our way. After all, would Australia’s performing arts community leap at the opportunity to perform in the bathrooms of fast food restaurants? Would the country’s fine artists get excited over the chance to decorate the seat covers of hardware store toilets? I doubt it. The Red Room Company are encouraged to continue their mission to distribute poetry to the wider community. I’m sure there are plenty of opportunities waiting to be discovered and explored. But, please, no more Toilet Door Poetry. Sometimes you have to wonder if the worst thing that can happen to a band is that they receive immediate approval and adulation. 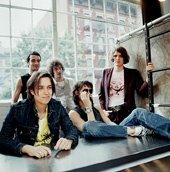 The Strokes have spent the last five years getting over the success of ‘Is this it’, their every move examined in response to that much-lauded album. Some criticised the follow-up ‘Room on fire’ for being too much like ‘Is this it’, and others said it was too different – they couldn’t win. Their third album was always going to suffer from the same anticipation and analysis, and it was always going to disappoint. In the end, they have tried appease both camps – those looking for something new, and those pining for ‘Is this it 2’. It’s a move that doesn’t always pay off. New producer, David Kahne (The Bangles, Cher, Paul McCartney) has given the sound a layer of gloss and muscle while, at the same time, retaining much of the band’s trademark ‘transistor-friendly’ low-fi fuzziness. Julian Casablancas’ strained and sloppy vocals even seem occasionally out of place amid the clean guitar sounds and ultra-tight rhythms. The opening sequence of songs is as good as anything they’ve done. ‘You only live once’ could be The Cars circa 1978, with its chugging guitars and mechano-beat. First single ‘Juicebox’ is propelled by a Peter Gunn bass riff and slashing guitars, while ‘Razorblade’ and ‘On the other side’ channel an array of 70s influences including ’new-wave reggae’ and Barry Manilow’. At six songs in, ‘Ask me anything’ finds Casablancas singing with only a mellotron for accompaniment. It’s a welcome change of pace. Unfortunately, the quality isn’t maintained throughout the second half of the album, and songs like ‘Vision of division’, ‘Killing lies’ and ‘Evening sun’ seem laboured and uninteresting. And the experiments here fall flat – the odd ‘Zorba the Greek’ guitar soloing in ‘Vision’ and tempo shifts in ’15 minutes’. It’s also about this time that you realize this is a very long Strokes album. It is, in fact, longer than ‘Is this it’and ‘Room on fire’ combined. One wonders what another 30-minute album might have sounded like. There are at least four or five songs that would not have been missed. Maybe they should try something completely different next time? An album of instrumentals? Synth-pop? A dance album? Rid themselves of the ‘Is this it’ curse for good.